As you all know, I've recently been a part of an African adventure -- an African cultural show that is. I know that some of my readers have left wonderful messages, bidding me a pleasant travel to Africa, and to take lots of photos from my international trip (special mention to Patricia, Mrs. Kolca, and Philip). I had fun but I didn't get to take that many photos of the show itself (I was prohibited from doing so). As I've said, I really didn't go to Africa. I was just invited to watch a show that would feature much of the continent's arts and culture. I recently won a Twitter contest that was sponsored by SOLAR's 2nd Avenue, and they gave away 2 tickets to 10 winners each. And what was given to me were 2 Premiere Left tickets to CIRQUE MOTHER AFRICA. Yes, I had front row seats, and we loved the view! On to the show then! 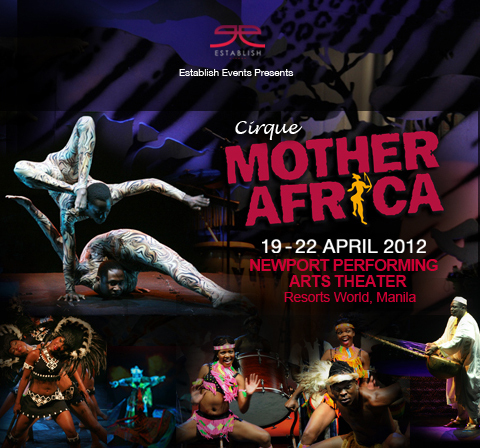 Cirque Mother Africa had its first showing last April 19 -- a 2-hour show that also had a 20-minute intermission. The show was supposed to start at 8 PM but we probably waited a few minutes more before we were allowed entry to Resorts World's Newport Performing Arts Theater. And due to some technical difficulties, we were advised that they will be starting in 15 minutes. Unfortunate for us, they only started to raise the curtains at around 9:30-9:45 PM. Our African guests really tried to make up for the delay. 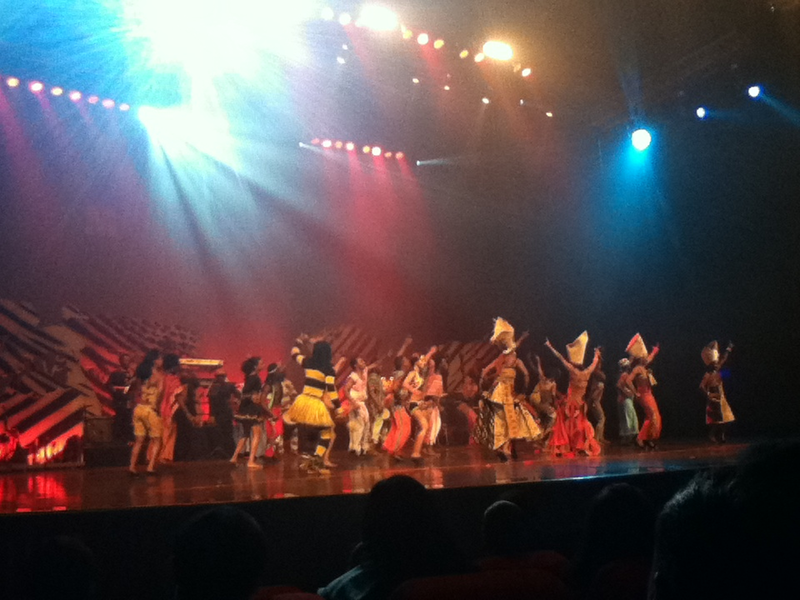 Anyway, the Cirque Mother Africa group was composed of both male and female performers. Almost all of the ladies knew how to do their acrobatic tricks, and also knew how to sing and dance. The guys on the other hand were also as remarkable. Most of the performers had us up our seats with some of their mind-boggling acts. 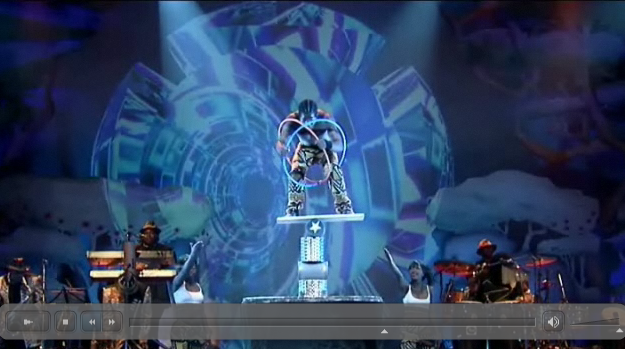 Also, Cirque Mother Africa was more like an African variety show. Their music, songs and chants may have not been well understood by the audience. But their dance and circus acts made quite an impression. But as far as the show went, I only had a few favorites. My first and second favorite's would be the two ladies who played with a few colorful mats, while balancing each other's bodies alternately; and the two well-built guys who made each other their own personal swinging poles. I really don't know the right terms or descriptions for these performers but their acts were totally insane! My third favorite would have to be the guy who had to balance himself using only a board that was placed on top of four rolling cans. His act was to balance himself from these cans! I was actually panicking for him while he was up on the board! The fourth and most memorable act for me would be the contortionist. I first saw him from when he sampled his flexible moves on Umagang Kay Ganda. The guy looked like he had no bones to him! He could even make his lower body to do a 360 turn without even flinching! And the good part about his act was he was really playful with the crowd. Now, the fifth favorite would be the whole group's rendition of Shakira's "Waka-Waka". I loved it so much that I found myself singing along with them! Overall, the 2-hour show was just about the right mix. 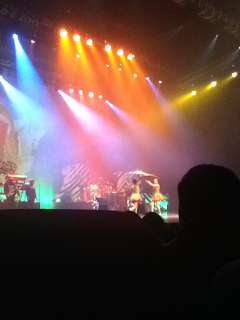 I actually had high expectations of the show since they labeled it as the Cirque Du Soleil of Africa. But it failed to 'wow' me all the way. There were even a few dragging moments that had me yawning from boredom. But if you still want to catch the show tomorrow, make sure not to get your hopes up. Don't get me wrong though, as it's still a worthy investment. And it wouldn't be a waste of time to watch it either. They are in fact performing for a good cause, which is very remarkable. P.S. 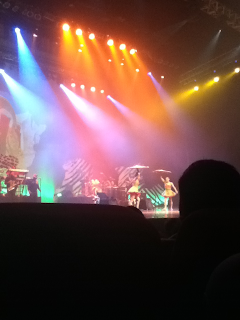 Most of the photos that I've attached were taken as screen shots from this Cirque Mother Africa's Official Website and from my handy dandy iTouch4. You're so fortunate to get the chance to see the show for free. You're living your life quite pleasantly... just be HAPPY! you're lucky to have won that ticket!!! , I've never seen a show like that live yet ever!!! ... now, it's tempting! Some people just own all the lucks in the world. 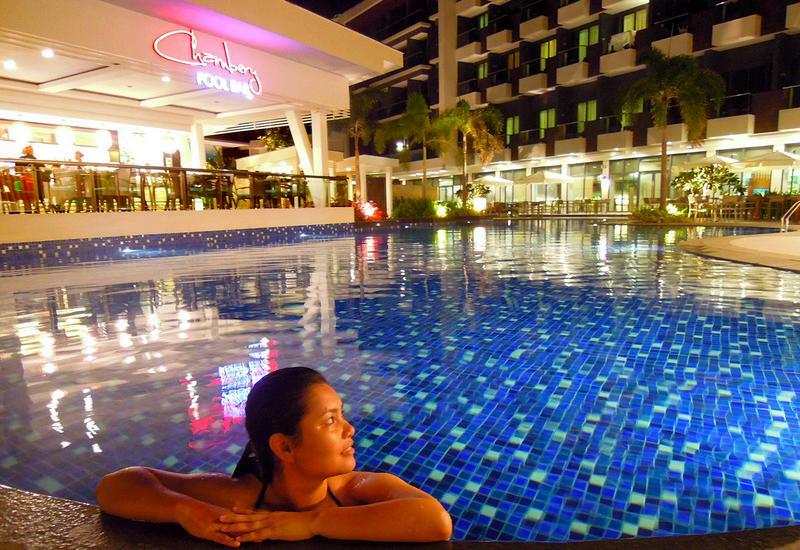 Winning twitter contests at that to travel for free. Girl! You are just one of the few. The show is great. Those pictures show. I would love to watch it myself. Wow, an African show in the Philippines! Can't get more exciting than that. :) I lived in Africa in the last 3 years (2 years in Ethiopia) and 1 year in Sudan, and I can say I really love how Africans perform, especially when they dance to the beat of drums. They usually put their heart and soul into their dances. You should watch it Ms. Gemma. Try checking their schedules. Their show here in Manila just ended yesterday. yes, you had us excited with Africa. thanks for sharing Mai. wish i was lucky as you to win tickets. haha. geez! those two guys balancing two of them looks so darn scary!!! their eyes look so funny haha! Perhaps it's not as jaw-dropping as the Cirque du Solei shows but Im sure it would still be exciting to see this here. I saw Varekai last time and that was superb! You should watch the CDS Saltimbanco so you can compare. Tickets are selling fast. Waaah! Serious ate? I'm definitely watching Cirque Du Soleil!!! Hey Shawi!! Maybe it's time to check up on twitter contests every now and then. i actually just stumbled on this one. Luckily, I won. hehe. You're absolutely right, Yuuki! I tried taking a few shots without getting caught again. And I think all casino's don't permit picture-taking. I also witnessed such a rule when I tried taking photos inside the Venetian Hotel Casino in Macau..
the real cirque de soleil can never be surpassed...so it's a bit of a letdown when groups like this present and they are expected to do as well as the original since they also use the name "cirque"
Thanks for satisfying my curiosity about this show. I do not think I would spend for this kind of show though. The last time I watched a show in Resorts World was "Kaos", which was fortunately a gift. But 'Kaos" was a good show and circus! Wow I missed this one! Maybe next year if ever they come back I might be able to watch. Balancing act is almost always a part of a show. Be it in China, Hingkong. Singapore etc. In the province we get to see kids and adults alike perform and do balancing acts. Argh! I regret turning down an invitation from a friend who had free tickets too :( Looks mind-blowing! a friend of mine invited me here, and I had to turn her down because of work. nakapanghihinayang tuloy.. I was planning to watch this event pero after reading your post I am quite discouraged na to go. Medyo late na yun nag start. Oh, I heard about that too.. have you seen varekai? I heard it's also a great show. Congrats on winning! Lucky you :) At least you didn't have to pay for something that didn't completely "wow" you, but it looks you did have some fav. moments. I'll be watching out for this one should they ever come back. Good stuff! How I wish there are shows like this in our place! Anyway, the performers will have to do well next time. It seems like I'm getting to watch the same acts as the ones I see in Talentadong Pinoy. The show seems nice and spectacular. Good thing di sila ganun kahigpit when it comes to taking pictures of the performance itself. Mahigpit po sila actually, eto nga po sinulat ko sa post ko above "I had fun but I didn't get to take that many photos of the show itself (I was prohibited from doing so)." Sorry sis, diko gets.. hehe! Ano jan ang epic comment? I know!!! Despite a few glitches, the show still did a good performance. It wasn't like Cirque Du Soleil but the show was still remarkable. =) How was the sound of music by the way?